Welcome to Heritage Christian Academy's web page! Information for prospective and returning students and their families. Information about our Elementary, Middle School, and High School curriculums. View the official school calendar to know when holidays are observed, parent/teacher conferences & breaks occur, and when grading terms end. Find out which restaurant is serving on a particular day and what the daily entree will be. This is our school newsletter which is published weekly from August through May. Congratulations to Will Groves! He has been selected to be part of the 2019 Governors Scholar Program. 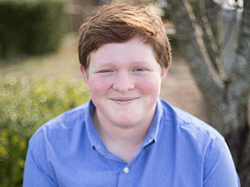 Will is an all-around great student, and HCA is so proud of his accomplishments! GSP is a summer residential program for outstanding high school students. 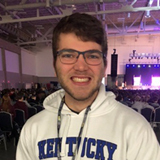 As a Governor's Scholar, he will attend a five week residential program this summer with the opportunity to apply for GSP-based scholarships his senior year. Way to go, Will! Congratulations to Lawson Ashby and Kayley Wadlington! 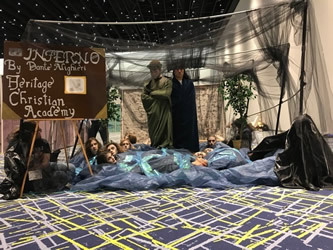 HCA’s Beta Club won first place in state in the area of living literature with their Dante’s Inferno depiction. Here, HCA students take part in an enactment of a drawing by Gustav Dore from Cantor 32 in Dante’s Inferno. 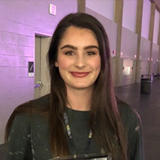 Shaylea Turner placed fourth overall in On-Site Drawing competition. Matt Nason placed fourth overall in Science. "I have been at HCA since first grade. It did not take long for me to realize that Heritage is exactly where God wanted me to be. The faculty and staff at Heritage makes everyone feel like family, and there is a genuine concern for each student. Mrs. Garris is our headmaster, and I feel comfortable going to her with any concerns. The students here are awesome also. They made me feel welcomed and I am sure I have made some friends for life. HCA is a school where biblical principles are taught and God is the foundation. I highly recommend Heritage Christian Academy, and I am proud to be a WARRIOR! " "HCA is such a great school for many reasons, one of which the teachers. They are so great and are always willing to help. The saying, “you learn something new every day” is actually true. The teachers help everyone and will answer all of your questions. Another reason HCA is a great school is the classrooms. The environment is so friendly. If you have a question that you think is dumb, just ask it, and no one will make fun of you and you’ll probably get lots of answers. The classes are smaller so the teacher can focus on everyone. " "HCA is the best school in Christian County. Our school was founded in order to give a good education and to learn about God. Our teachers are great, and well educated themselves. They teach us exactly what we need to learn, in the way we need to learn it. These things are what makes our school the best." "Our school is friendly and welcoming to everyone. The teachers here help us with our problems, whether its school related or something personal. They don’t tolerate any kind of bullying. Teachers are very nice and easy to talk to because they listen. We also have great academics. Especially since our Middle School Academic Team got second place overall in the district and our high school got first place overall. We have a great school and there are wonderful people who go here." "I am privileged to attend a Christian school because I am free to pray and talk about God. I even have a Bible class, and chapel every Thursday. I think it is great. I am very happy to go to HCA." Enter your email address to receive the Weekly Warrior in your inbox. © Copyright Heritage Christian Academy. All Rights Reserved. Design by Doodlebug Web Design.